The City of London is the oldest part of London, and yet with its towering sky scrapers it is also the most modern. Not to be confused with London as a whole, or Greater London, the City of London is in fact a very small area of central London, from which (along with the City of Westminster) London as we now know it has sprung. Also known as ’The City’ and ’The Square Mile’, the City of London is London’s chief financial district and along with Tokyo and New York City forms the world’s three most important financial centres. In fact London is by far the largest foreign exchange trading centre in the world, handling around one third of all forex trading. Historically the City of London is ancient, founded in AD43-50 by the Romans. Throughout its colourful history, London has seen at least fifteen major fires. The worst of all, and the most famous - the Great Fire of London in 1666 destroyed many historic buildings, but in fact enabled a new better planned London to be rebuilt with superior buildings and wider streets. Nearly three hundred years later during the Second World War, more of London was again destroyed in the Blitz, but the number of buildings that survived both catastrophes is impressive. As London expanded through the centuries, so people moved out of the City and the City is now almost exclusively given over to business. Though some 300,000 people work there each week day, its resident population is a tiny 8,000. St Pauls Cathedral (St Pauls tube) is the most visited spot in the City. Built after the Great Fire to replace the Church that had previously stood there, it’s galleries (with the infamous Whispering gallery) and crypt are legendary. Leadenhall Market (Bank tube) is a Victorian glass and iron covered marketplace interspersed with numerous cafe’s, bars and shops. The Lloyds of London building (Bank tube) designed by Richard Rogers is worth a visit- it resembles a space rocket ready to lauch. The building is a marked contrast to the classically designed buildings next door. (Rogers also designed an equally controversial complex in Paris, the Pompidou centre) You’ll either love or hate it’s garish construction, but there’s no denying it’s impact. 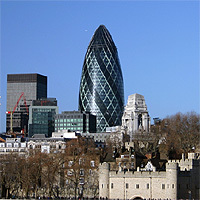 Nearby the Swiss Re Tower, depicted in the centre of the photo above, is another recent addition to the London skyline. Designed by Pritzker Prize winning architect Sir Norman Foster, it contrasts strongly with the Tower of London inset below, but in a surprisingly complementary way. The Old Bailey (St Pauls Tube) is England’s most infamous court house, and has witnessed most of London’s most serious criminal cases. Trials taking place are open to the public. Tower Bridge (Tower Hill tube), built in 1894 is one of the finest, most recognisable bridges in the World and enjoys breathtaking views over London. The Tower of London (Tower Hill tube), founded nearly a millennium ago has transmuted from castle to prison to palace, and for many was their last sight on Earth. The history of the Tower of London is both fascinating and diverse and today houses the Crown Jewels, William the Conqueror’s White Tower, the Traitor Gate and the Bloody Tower. Allow the best part of a morning or an afternoon to take it all in. For the official website of the Corporation of the City of London (the city's local government) see the Corporation of the City of London.